As the WSOP main event ploughs on we take a trip out to Las Vegas to sample the 1st Binions Poker Classic, at the place "where it all began", Binions Gambling Hall. 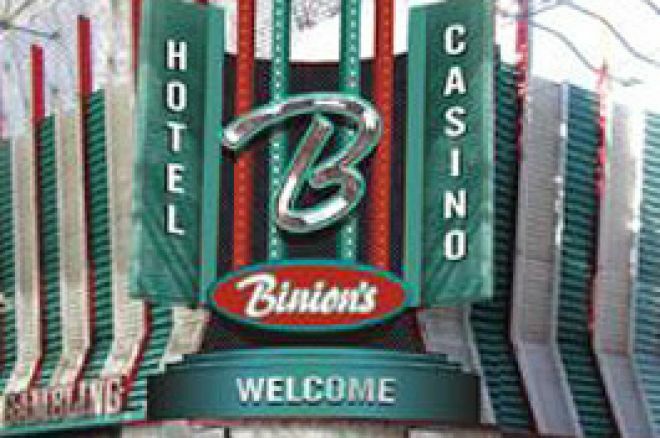 Binions is a name synonymous with with poker and gambling. The famous old casino, in downtown Las Vegas, is one stop poker players must surely make if they head out to Nevada to try their luck. There is a delightful "old school" feel to downtown Vegas. The glitz and glamour of the Strip is left behind somewhat. The clientele are very different too. Where as the Strip casinos attract a large quantity of blurry eyed tourists, downtown establishments appear to attract more locals and visiting residents from near by states. Poker is something that hits you straight in the face the moment you enter Binions. A wall of famous world champions, from Jonny Moss to Joe Hachem, stare down at you in an almost intimidating fashion. Tables signed by the most famous names in poker litter areas of the casino. Photographs of the latest champions, from the 1st Binions Poker Classic, also make an appearance, perhaps to give some inspiration to those hoping to catch a break and make some history for themselves. The Binions Poker Classic festival was coming to a conclusion and it seemed only fair to give the $500 No Limit Hold'em freezeout a shot. Given the relatively small buy-in it was a surprise to find such a playable tournament structure on offer. 10,000 starting chips and a 40 minute clock made for an almost championship structure. I certainly didn't hear a word of complaint from any of the 192 runners. The tournament was run in super smooth fashion. At one stage some loud railbirds were despatched from the casino by a no-nonsense female tournament director, who was all of 5ft 2in and 120lbs. I got the feeling she'd dealt with "rabble" on occasions before! The tournament ended at 5am with UK PokerNews writer Damien Oborne claiming first place for $20,000, after an entertaining heads-up match against the self styled "bad boy of blackjack" and American actor, "Hollywood" Dave Stann. While many will enjoy their experience at Binions Gambling Hall there are a couple of aspects of the casino that need urgent and vast improvement. The gentlemans restrooms are, quite frankly, a disgrace. Broken toilet doors and a general dirty feel in the restrooms had me leaving the casino to use the facilities across the road at the Golden Nugget. The food at Binions also leaves plenty to be desired. There is nothing really wrong with the food itself despite it being over priced and bland. However, a smile and some acknowledgement that your order is being processed would be great. Don't let these minor complaints put you off Binions. This is somewhere you must see if you head to Vegas to play poker.